When I saw this post by Cathy of The Dutch Baker's Daughter, I was very inspired to get involved and show my support for Ovarian Cancer Awareness month, as well. I do not know anybody who has directly suffered from Ovarian Cancer, but I know that it can affect myself or someone I know and love in the blink of an eye. Knowledge is power. A while back I saw these tempting Jalapeños cooked up by someone, somewhat popular. I know that you know that that was tongue-in-cheek. Everybody knows The Pioneer Woman. Preheat your oven to 375° F. Line a baking sheet with foil and slide a rack on top. 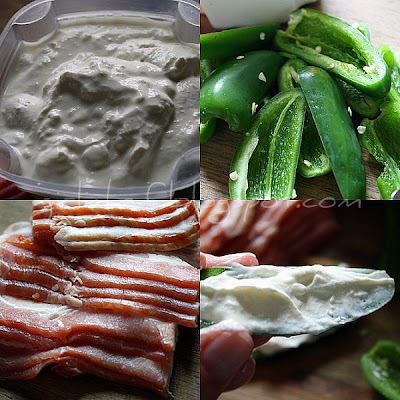 Line up your ingredients and begin by packing some cream cheese into each jalapeño half. Next, wrap each stuffed half with a piece of the bacon. You can secure with a toothpick if you'd like. Or simply place on prepared baking sheet. Place in oven and bake 20-25 minutes...until the bacon is perfectly browned and melded to the outside of the chili. Eat 'em hot or at room temp....as a snack...or made as a component of a whole meal like this... A friend of ours made a huge batch of tamales. I adore tamales, especially when you heat them on a comal until the outsides are golden and crisp and the innards are all warm and toothsome!! Simply plate them up with some salsa and a dollop of crema, sour cream or even homemade cream cheese (like I did...to bring them together with the jalapeños...which I used as a sort of garnish) and add a few stuffed, wrapped jalapeños and you've got an amazing, soul warming, mouth watering meal! ◦3rd: Signed copy of Vino Italiano: The Regional Italian Wines of Italy by Joseph Bastianich (winner chosen by Michelle). ◦One winner chosen at random will receive a Teal Toes tote bag filled with ovarian cancer awareness goodies that you can spread around amongst your friends and family. ◦Ovarian cancer is the leading cause of death from gynecologic cancers in the United States and is the fifth leading cause of cancer death among U.S. women; a woman’s lifetime risk of ovarian cancer is 1 in 67. ◦The symptoms of ovarian cancer are often vague and subtle, making it difficult to diagnose, but include bloating, pelvic and/or abdominal pain, difficulty eating or feeling full quickly; and urinary symptoms (urgency or frequency). ◦There is no effective screening test for ovarian cancer but there are tests which can detect ovarian cancer when patients are at high risk or have early symptoms. ◦In spite of this, patients are usually diagnosed in advanced stages and only 45% survive longer than five years. Only 19% of cases are caught before the cancer has spread beyond the ovary to the pelvic region. ◦When ovarian cancer is detected and treated early on, the five-year survival rate is greater than 92%. 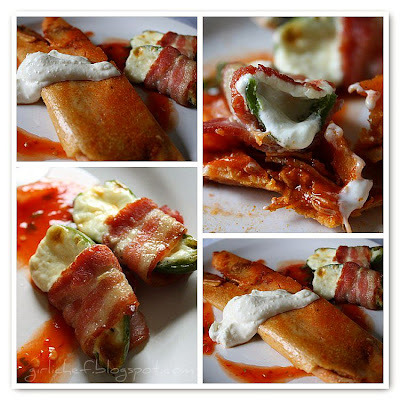 I love bacon wrap, and I must try this cheesy wrap-up. Tamales...I am not sure that I have seen them before, but from what you have described, I am pretty sure I would definitely love them! A good pic for a good cause. I'm saving this. anything with bacon is to die for..
OK, those look just heavenly! What a great cause too. Yum! Those peppers look AWESOME! What a tasty way to promote awareness. Thanks for sharing! These stuffed jalapenos look amazing! The perfect amount of spicy and cheesy. And a bit of bacon never hurts :D.
I wish I had heard about this contest sooner! I would have loved to participate. What a great cause. 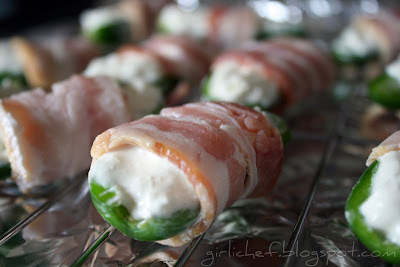 I'm loving the idea of these stuffed jalapenos - so good wrapped in bacon, yum! Great cause! Oh boy, I am totally making these bad boys! YUM. I just found my Thanksgiving appetizer! YUMMY! Thanks for sharing. Yes, I want a bite. And yes, I want to participate. I unfortunately do know someone who died way too young from this silent disease. Thanks for the info. "a bite" hell no! put about six of those on a plate for me! These look delish and such a noble and close to the heart cause. I wish I would have known about the contest earlier. I would most definitely participated. I am a survivor of this diease. what a great dish for a great cause! and i'm excited about your new blog! I just love these little jalapeno bites - I am so glad you posted them. A great cause, what a delicious way to raise awareness. Now, can you come over and teach me how to make tamales? Please? i had a dear friend pass away of ovarian cancer. she was a great person. it is wonderful you took part. I really loved your recipe today. I also want to thank you for the heads-up regarding blog efforts for ovarian cancer week. OMg that was a cheesy announcement! You're too cute. As much as I love your jalapeno peppers, I have to say it's those tamales that are speaking to me. "I adore tamales, especially when you heat them on a comal until the outsides are golden and crisp and the innards are all warm and toothsome!!" That is my absolute favorite way to eat them. With a plate of runny eggs and beans and homemade tortillas. You're making me miss my grandma! I was going to make a food for the contest bu that means it's due tonight! right? Bob...YOU MUST!! That's what's so great, you can make just a couple or a monster batch!!! Totally worth it. I could not stop poppin' in until they were absolutely gone!! Addicting. These look delicous-I am always hungry when I visit you. Great cause! Awareness is power. Thank you for taking the time to share with your foodie friends. I am still getting a few jalapenos from my garden each day-not as large as seen in the recipe but, I think I can do this with my small ones. Great recipe! i just drooled all over my keyboard. that looks amazing! I bet these were amazing with your home-made cream cheese!! oh wow but the most impressive thing is your homemade cheese you rock ! this is such a great way to support ovarian cancer awareness..let me see if i can also post something for this. Did i hear homemade cream cheese?? yummy yumms! 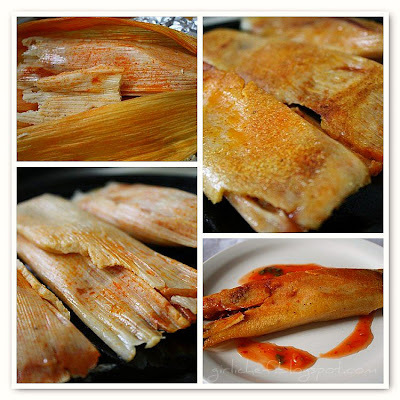 I would love to try some of those homemade tamales. And homemade cream cheese...over the top. All I can say is, Girli, have mercy! Awesome, mouth-watering, I LOVE THESE! Thank you! Um yes, I do want a bit, thanks for offering! Oh my gosh, stuffed jalapeno's and tamales, MY WEAKNESS!!!! Love it!! I love these...and I love that you made your own cheese. Awesome! And now, I want some tamales. Mmmm. Amazing recipe. You always make me want to try my hand at your creations with those wonderful photos. This looks amazing. 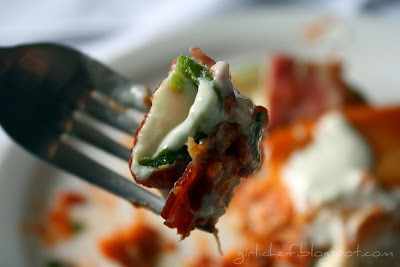 I love stuffed jalapenos!!!!! I actually made homemade tamales tonight. Beef and Chicken. I will be posting them tomorrow. Thanks for that good post. Anything cloaked in bacon is a good thing! These look absolutely delicious! 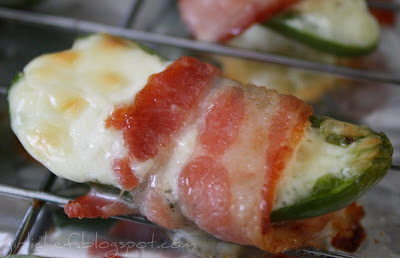 Spicy Cheesy Stuff wrapped in Bacon??!!! Oh my! You've outdone yourself...and you've got my number! I MUST MAKE THESE! WOW...a great recipe to try with all those peppers from the garden, where's my gloves??? Spicy food boost your metabolism, I think you will need as much of that as possible with this delicious recipe.